Summary: While we normally focus on vegan and gluten free meals, books, and food products, it can be challenging to find other consumables that are both vegan and gluten-free. For instance, what do you get to cheer up your favorite vegan and gluten-free loved one who is ill? We have all the products you need to put together a vegan and gluten free cold and flu kit that will put a smile on anyone's face. While we normally focus on vegan and gluten free meals, books, and food products, it can be challenging to find other consumables that are both vegan and gluten-free. For instance, what do you get to cheer up your favorite vegan and gluten-free loved one who is ill? We have all the products you need to put together a vegan and gluten free cold and flu kit that will put a smile on anyone’s face. Nature’s Way Sambucus Original Syrup – Many swear by sambucus or, elderberry, to treat symptoms of the flu, such as respiratory issues. Thayers Slippery Elm Lozenges – Slippery elm has long been used to soothe sore throats, and this lozenge heals and coats painful throats. 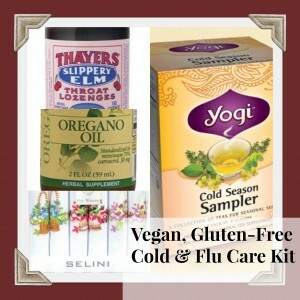 Yogi Tea Cold Season Sampler – Tea is a stabple in the cold/flu-fighting arsenal. Yogi Tea has an excellent collection of cold and flu teas, and their sampler offers samples of each one: Echinacea Immune Support, Cold Season, Breathe Deep and Throat Comfort. Oil of Oregano” – Many swear by the efficacy of Oil of Oregano in either fighting colds and flus, or make them run their course much faster. And don’t forget the handkerchiefs! This 6-pack of 100% cotton handkerchiefs from Selini are soft, and perfect to dry runny noses, without irritating sensitive skin. A huge coffee mug is always the perfect holder for these goodies, and then doubles to make a delicious cup of Yogi Tea.